Our amazingly beautiful and luxurious new home is also quite spacious. I was hoping for a bigger place than we've previously had when we lived in other Asian countries, thinking if we could get a place that was about 1300 or 1400 sq feet we'd be golden. At 3,800 square feet, I'm floored over living in a place almost three times bigger than what I dared to hope for! The kids play hide-n-seek and have a hard time finding each other. You can't call someone from one end to the other and expect them to hear you. It's way more space than we need, but during the horrible heat and monsoon season, it sure is nice to have an indoor place of our own where we can spread out and not worry too much about the walls closing in on you, giving you cabin fever. 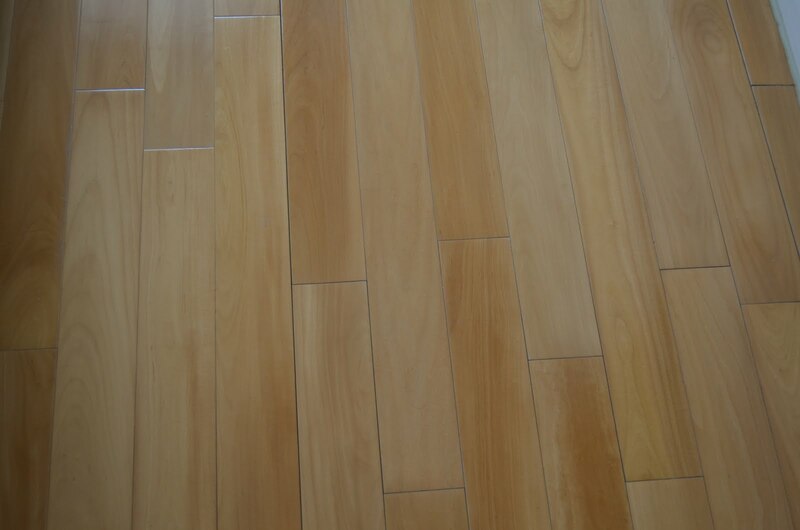 And all 3,800 sq feet are covered in hardwood or tile flooring. Not a stitch of carpet. I love it, it's amazing. I'll give you the full tour of the apartment as soon as our shipment of things from the US arrives and it finally looks like "home" to us, but today I'll show you the floors. Here's a corner of the balcony, which is 16 feet long by 6 feet wide. 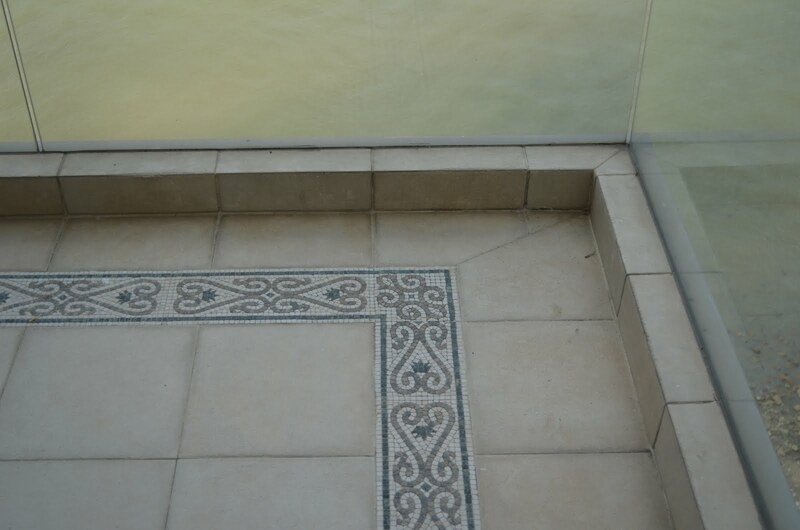 I love the intricate tile pattern. The kids like to sit out here and race their R/C cars round and round the pattern like a track. It makes me a wee bit nervous that the only thing separating them from falling eight stories to the street is a sheet of glass, but I'm trying to get over it, especially since the glass comes up to my tallest son's armpits. One of Michael's co-workers came over and told me not to put any furniture out there, lest they climb on it and fall over. Note taken. Here's the guest bathroom, the one you (yes you!) will be using when you come stay with us! 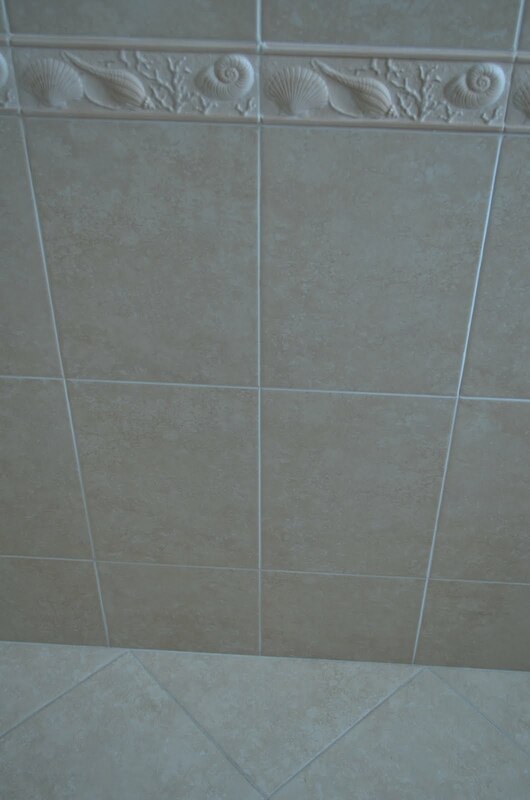 The floor is a very dark grey tile, with textured white walls and a patterned trim. This bathroom is very contemporary, and I can't wait to show you the rest! I'm trying to teach the boys not to use it, as we have three other bathrooms they can use. It would be so nice to have one for guests totally clear of little boys and their messes! 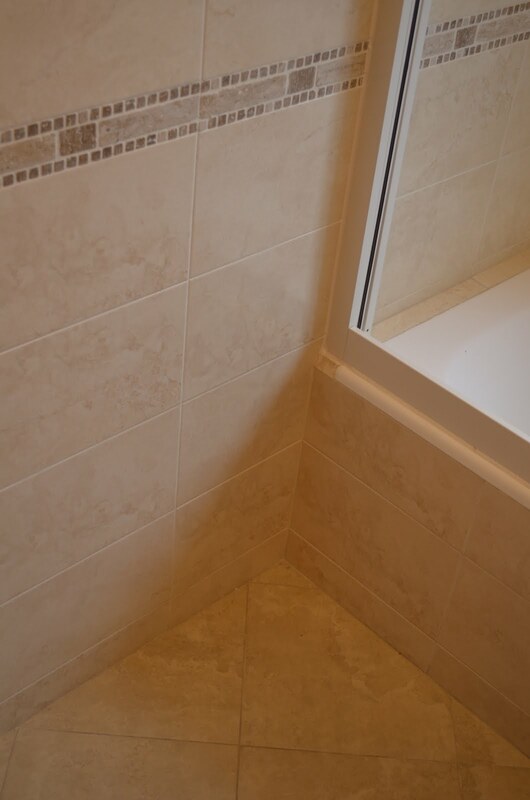 Attached to the guest bathroom is the guest bedroom, the room where you (yes you!) will rest your weary head after a long day of sightseeing around Macau! It has this lovely dark wood, which makes a nice contrast to the white cupboards that line the room. The entry, the living room, the dining room, all the hallways, and the maid's quarters are covered in these large creamy tiles. The tiles are butted right up against each other, so there isn't miles and miles of grout to clean. This little patch of tile is decorated with Ben and his LEGO bricks, the only toy we brought in our luggage (though we did bring a lot of their books). All the rest of the boys' play things arrive with our home goods shipment next month! 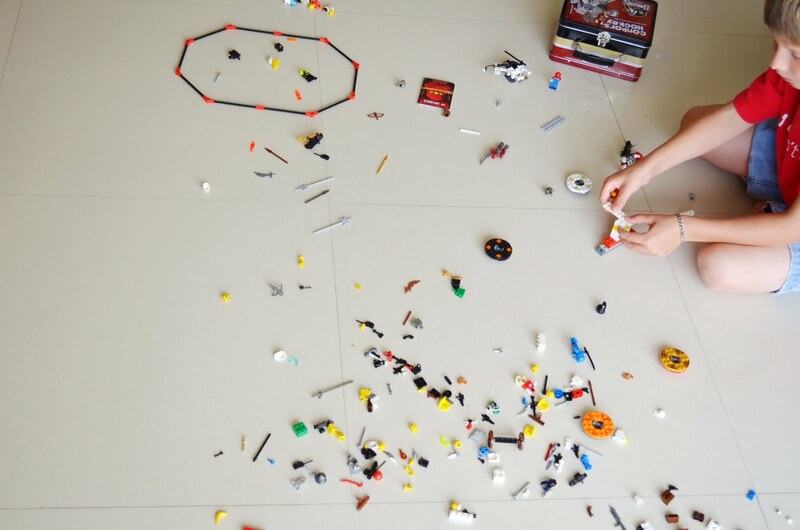 Good thing they happily play with LEGO for hours on end! Here is the master bathroom. I love the shell motif, which reminds me of home in Los Angeles, which was a mile or so from our old playground: the Pacific Ocean. Though we live right on the water here, it's not a beach. And though there are two beaches in Macau, we've been told to avoid the water. So if I want the beach, I simply go into my master bathroom! At about 8 by 14 feet, it is the largest bathroom we've ever had, and by far the finest. Here is the bathroom in the hallway closest to the boys' room and office. It's very similar to the master bath, but it has a different mosaic trim that runs all over the walls. 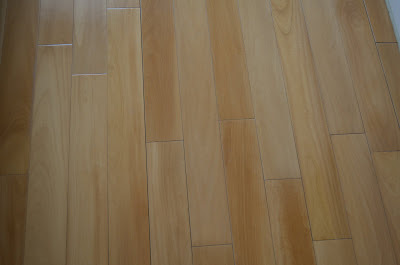 This wood covers the floor in the master bedroom and dressing area, the boys' room, and the office. 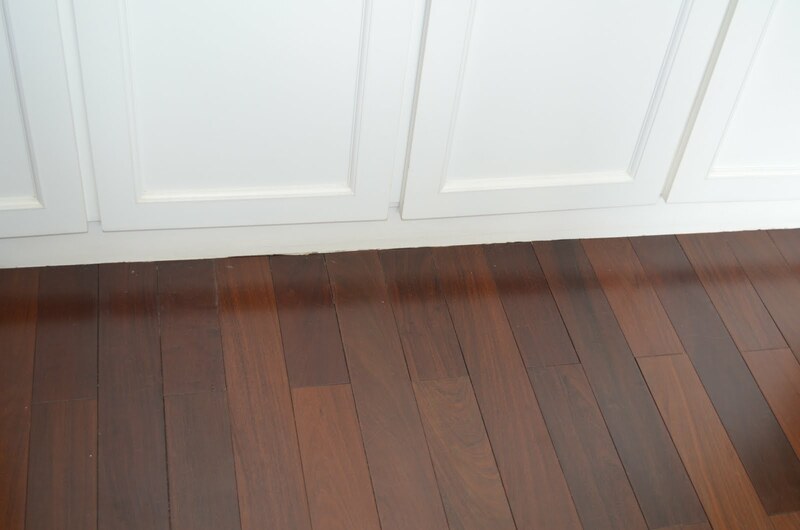 This color wood also makes up the miles of custom molding that surround each door. This is the kitchen, which is the only room in our home that doesn't get direct sunlight. 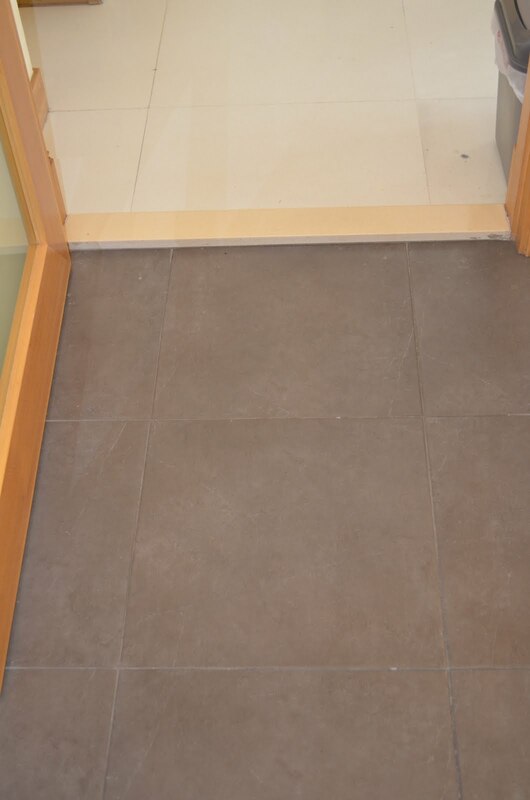 The floor is covered in these large matte grey tiles (though not as large as the tiles in the living and dining room as you can see through the doorway). If I had to pick a favorite floor in the house, this would probably be it. It feels as soft on your feet as tile can. It also covers the floor of the laundry room which is located off the kitchen. 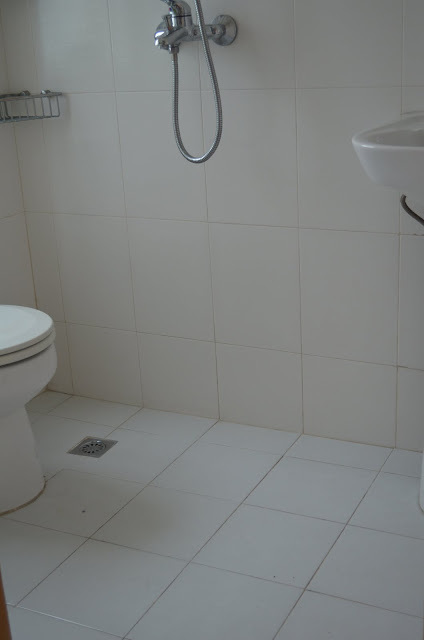 And finally, here is the maid's bathroom, which is a tiled room complete with toilet, sink, and shower all in one. 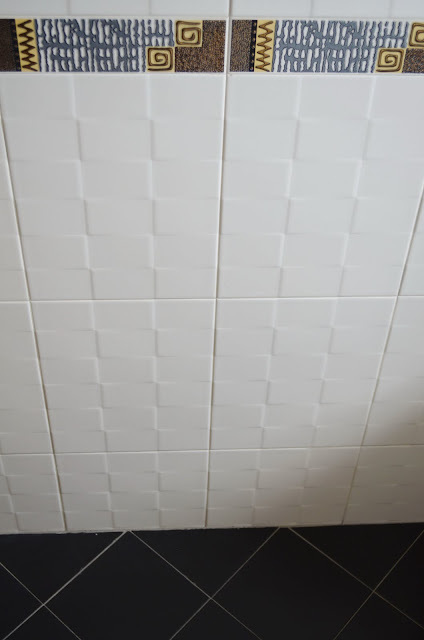 It's pretty standard utilitarian stuff, much like what you'd see in a public school bathroom, with lots and lots of grout (ugh). And while we do have maid's quarters, we are decidedly lacking an actual maid. Other things we are lacking? A big American-sized broom, a big American-sized roller-style mop, and my favorite floor accessory: a big American-sized Haan Floor Steamer, which would be useless here due to the difference in voltage (pausing to toss out a HUGE thank you to my awesome friend Lori who used the beloved Haan to clean all the downstairs floors in our old home before we moved out). You wanna know what tools I have to clean the 3,800 square feet of floors in this new home of ours? A string mop and bucket, and a tiny, short bristled broom and dustpan, which come up to about my hip. Which means hours of bending over to sweep and sweep and sweep. And though it's my Mom's preferred style of mop, I've never used a string mop! I've always thought it was just a prop used by Carol Burnett as the cleaning lady, not an actual tool used to clean floors! Never thought cleaning tools would be the things from home I'd long for! Yep, it's all in one. When I was in the USSR, all the bathrooms in the hotels we stayed at were just like this with a drain in the middle of the floor. Doh! I totally left out the pic of the boys' bathroom! I just went back and added it in. This is an amazing website which I enjoyed visiting. Our real estate agent is Monte at Macau Real Estate. His email address is Monte@Macaurealestate.com. But my recommendation is that you work with several real estate agents, different companies have access to different properties, they don't share! Please email me at hrosechase (at) gmail (dot) com if you have any questions (and for an answer on cost)! I'm always happy to connect with new people!